The environment is top of the agenda for Designer Contracts – the UK’s largest flooring contractor. The company’s award-winning recycling scheme sees all waste removed from site and taken back to its 12 regional centres, saving a staggering 250 tonnes of waste going to landfill every year. The programme not only includes flooring. Designer Contracts has invested £40,000 in a baling machine that helps to recycle 70 tonnes of cardboard and 20 tonnes of plastic every year. At the company’s national distribution facility in Kettering, which holds £2m worth of stock, it uses a computerised planning system to ensure maximum efficiency and to reduce waste. The recycling scheme then works by diverting 90% of fitters’ unfitted carpet into felt underlay. What isn’t turned into underlay is used in the equestrian sector for arena flooring. Fitters are supplied with a builder’s bag to fill with unfitted carpet to drop off at their nearest Designer Contracts regional depot. It is then taken to an approved recycling facility before being converted. Any waste created is removed from site and recycled wherever possible. Designer Contracts does not use customers’ skips. 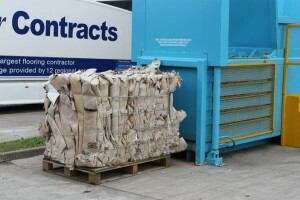 The company initially trialled its recycling scheme, spearheaded by Louise Abbott, Designer Contracts’ merchandise and marketing manager, in conjunction with Carpet Recycling UK (CRUK), at its central region based in Chesterfield before rolling it out to all 12 of Designer Contracts’ regional offices. Last year CRUK named the company ‘Take Back Partner of the Year’, for the second time. Graham Kempton, Designer Contracts’ logistics director was also honoured with the Recycling Champion of the Year award, for an individual who has gone the extra mile to ensure as much carpet as possible is recycled at their organisation. Designer Contracts also closely monitors all its central transport fleet to ensure that every vehicle is driven in a manner that minimises fuel consumption and emissions and has attained Fleet Operator Recognition Scheme (FORS) accreditation. It champions backload transport in all aspects of its business, including collection of stock from manufacturers on return journeys following deliveries to its own regional centres, and getting its recycling waste to the processing plant.